If you have never had homemade potato gnocchi and only the store bought kind, let me tell you you’re missing out! Traditionally an Italian dish stemming back to Roman times and made with semolina, potato gnocchi is a more modern and regional version of what is a cross between a dumpling and a pasta. Luckily it’s not hard to learn how to make potato gnocchi, which is a good thing since they are so tasty! Made by baking starchy potatoes and then mixing with flour and egg, potato gnocchi is a wonderfully light yet at the same time filling meal easily made at home. 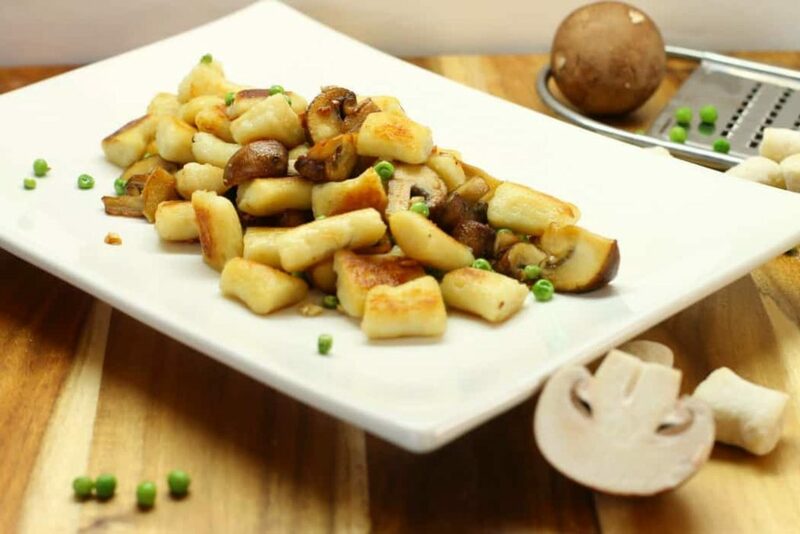 I first learned to make gnocchi while working as a student apprentice at the Prince George Hotel in Halifax, and they used to have a variation of this mushroom gnocchi on the menu. What really struck me about this recipe and other pasta recipes is how easy it really is to make. Once you understand the basic process of making the gnocchi, you can customise the dish. Serve it with homemade tomato sauce and fresh herbs, grilled spring vegetables, or roasted squash and spinach. The options are endless! 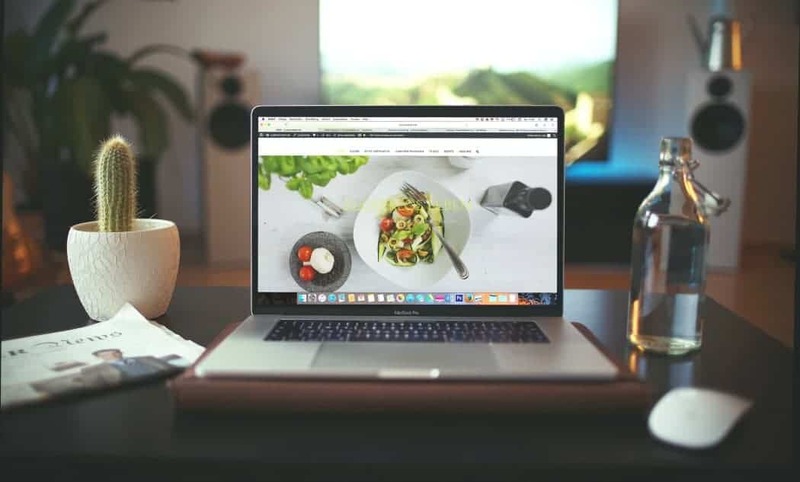 Even someone who has never made anything like it will be able to successfully make this delicious dish after reading this post. 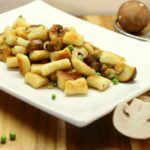 The wonderful thing about homemade potato gnocchi is that it is surprisingly easy to make with only a few ingredients required. 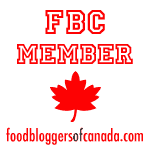 Having use of a potato ricer (affiliate link) is also highly recommended. This tool is the best and fastest way to ensure your potatoes are broken down uniformly while still hot, yet without developing lumps or becoming sticky. This is important if you want nice fluffy gnocchi. Besides the ricer, all you will need is a knife, mixing bowl and your hands. As for the ingredients themselves a ratio of 3:1:1(by weight), potatoes, flour, and egg are all that is needed. It’s important to use starchy and not waxy potatoes which are more suitable for boiling and used in potato salads or casseroles. Bake the potatoes in the skin for 40 minutes until they are completely soft. If they seem a little dried out that’s fine, less moisture is better here. You may notice that many other gnocchi recipes out there say to boil the potatoes. While you can boil the potatoes, it will produce a denser and wetter product. You want the potatoes to be light, dry and fluffy when you make the dough, which is why baking is the better option. Flour a sheet pan or cookie sheet and set it aside for later. You will need to work quickly once the potatoes come out of the oven. They need to be peeled and riced while hot. Letting the potatoes cool will also yield a denser gnocchi then if made while the potatoes are hot. This means you need to be careful not to burn yourself. Wearing regular clean cloth gloves (affiliate link) underneath of a vinyl disposable glove is the ideal solution to not burning yourself. If you’d like to do it the old fashioned way, simply do what my chef told me at the time ” If you work faster you won’t burn yourself”. Peel and rice the potatoes into a bowl. Add the pre-measured flour to the still warm potatoes and stir the bowl once to partially mix it under. Crack an egg into the bowl and continue mixing the dough using your hands. Lightly flour your hands to prevent the dough from sticking. The best way to mix the dough is to fold itself over on itself until everything starts to stick together in one mass. At this point turn the bowl out on the counter and incorporate any flour that did not yet get mixed in. It is important to note, that as little flour as possible should be used to keep the gnocchi light and fluffy. Overmixing the dough is also a big no-no. 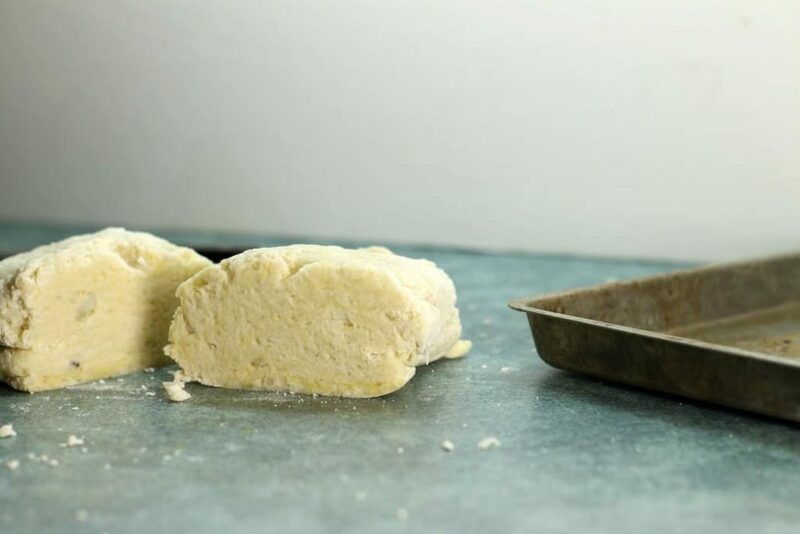 this develops the gluten in the flour, much like it would while kneading bread, which leads to a chewy end product. In regards to using the egg in the recipe, this is again a subject of debate among chefs whether it is part of traditional gnocchi and various regions of Italy will either include or exclude the egg. In my opinion, the egg adds a little flavour and richness. It also has the benefit of helping bind the gnocchi dough together, which is helpful for someone who has never made it. Once the dough has mixed, cut it into four equal sections. Using a dry dishcloth cover the pieces you are not about to work with to keep the dough warm. Roll out the section of dough until you have a nice long half inch thick roll. Using a sharp knife cut off half inch pieces of the roll. Since the dough may still be warm, the blade may start to stick as you cut. If this is the case, dust the glade with some flour and keep going. Clean the knife if you start to get a buildup of dough/flour on the blade. Working quickly yet gently, transfer the cut gnocchi dumplings onto the floured sheet pan, making sure they are not sticking together. Roll out and cut the remaining three sections of dough. You can either boil the potato gnocchi right away in salted boiling water, or you can place the sheet pan right in the freezer to IQF (Individually Quick Freeze) the dumplings. Freezing them has the benefit of longer term storage, and you can simply drop the frozen gnocchi into boiling water when you feel like having some at a later date. If you boil the gnocchi fresh they will need to be cooked and eaten in the next two days for optimal freshness. As you can see the process of making gnocchi at home is fairly straight forward, you just need to know how! Now for the fun part. Cooking, flavouring and eating the gnocchi! 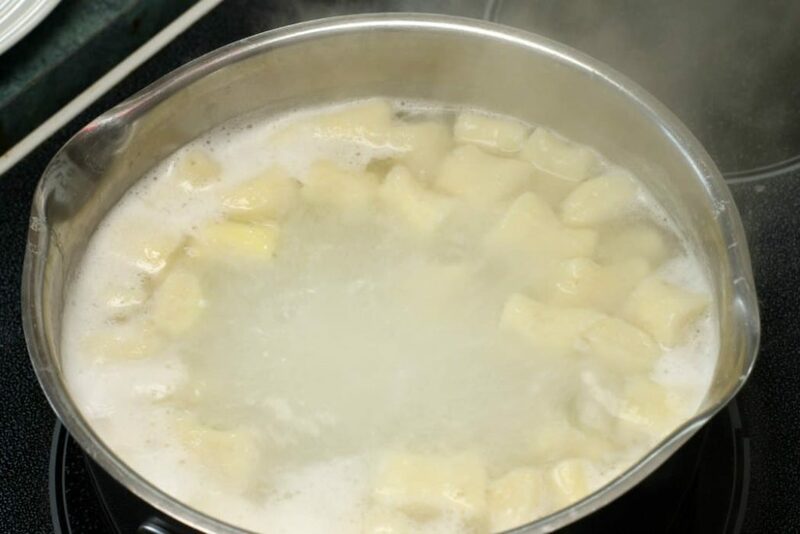 Boil either the fresh gnocchi or the frozen dough in a pot of boiling salted water. As soon as the gnocchi float, they are finished. using a slotted spoon, scoop out the gnocchi and place in a separate bowl. As mentioned above, you could simply toss the gnocchi in homemade tomato sauce and fresh herbs at this point for a quick and easy meal, especially if you had the gnocchi frozen in the freezer. Much like German spaetzle noodles though, gnocchi can also be pan fried. If you do want to pan fry the Gnocchi, it’s best to boil them either fresh or from frozen, strain then toss them in oil and cool completely. Tossing them in oil will prevent them from sticking to each other, and since they already coated in a bit of oil they will fry easier. 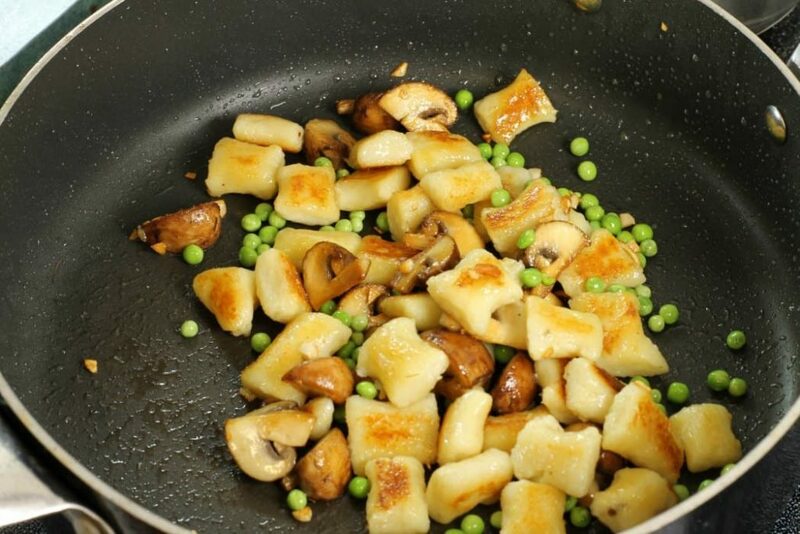 Cast iron pans are ideal for frying gnocchi as they retain a lot of heat and have a natural non-stick surface. Heat some clarified butter or oil in your pan and drop in your gnocchi, being careful not to splash yourself with hot grease. Let the homemade gnocchi cook for about a minute before you gently shake the pan to loosen them from the bottom. They should be a nice golden brown. Add your mushrooms and keep cooking until they also start to brown, make sure to toss the pan regularly to avoid the gnocchi from sitting on any one side for too long and burning. Lastly, toss in a handful of peas and season with salt and pepper. Garnish the dish with some fresh shaved asiago or other cheese and enjoy! Pre-heat your oven to 375F. Line a baking sheet with parchment. 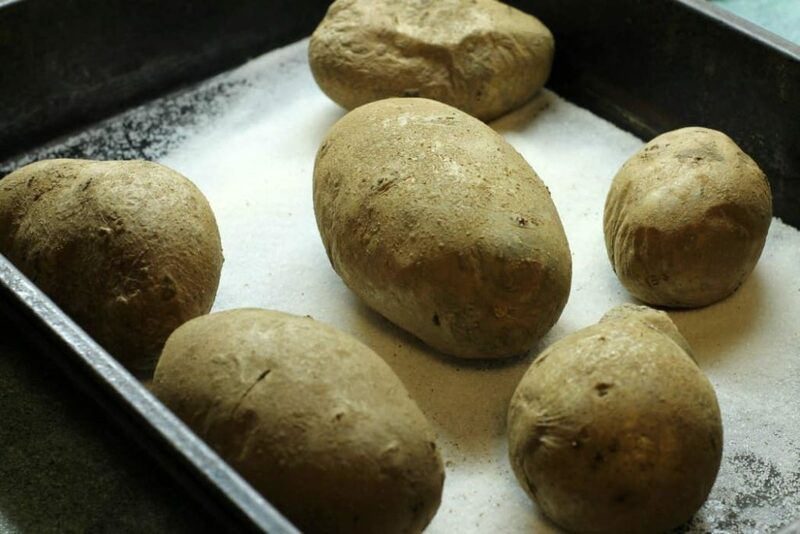 Bake the potatoes for at least an hour on a bed of salt to help draw out moisture. Once cooked scoop out the hot potato flesh and press through a ricer to ensure there are no lumps. Mix in the flour and egg and "knead" until the dough forms one mass. Do not over mix. Cut the dough into 4 equal pieces, and roll them into half inch think rolls. 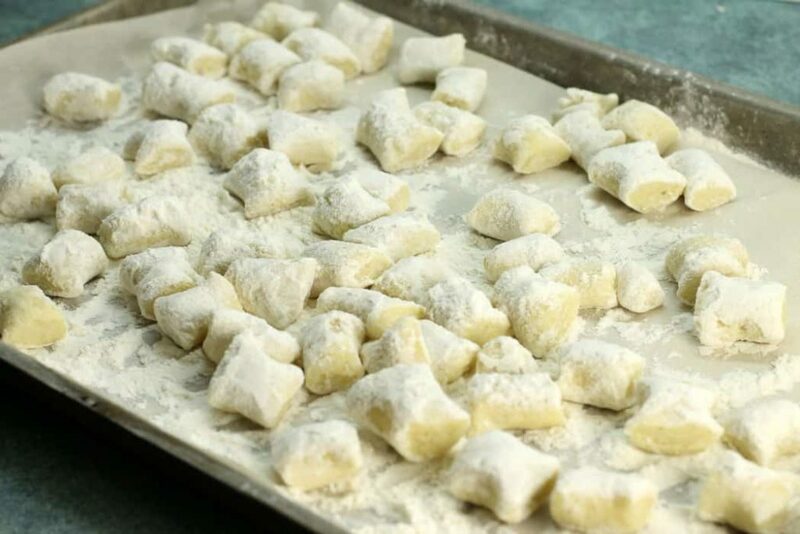 Use a knife, and cut the gnocchi into bite sized pieces. Gently transfer the cut gnocchi to the sheet pan and either freeze for later use, or boil in a pot of salted water right away. Sear the gnocchi dumplings in a little clarified butter or oil until golden brown on both sides. Toss in 1/4 cup chopped or quartered mushrooms. Saute until the mushrooms are a nice golden color. You can add a pinch of chopped garlic for extra flavour at this stage. Toss in a handfull of frozen or fresh peas, and season the dish with salt and pepper. Garnish the Gnocchi with herbs or slivered cheese such as asiago. Pan fried gnocchi is a fave of mine. I love them with a sweet corn sauce in the fall! I’ve only ever made ricotta gnocchi so I’m going to bookmark this – love the tip about baking the potato instead of boiling! I love Gnocchi and these look so good, Markus! Combining them with Mushrooms elevates them to an epic level. thank you for sharing your recipe with all of us. I will happily try it – I was playing with Shemiji mushrooms yesterday and think that these would be fun to add in your version of gnocchi. Let me know how it goes! I love getting feedback on the recipes! Shemiji mushrooms would work great!